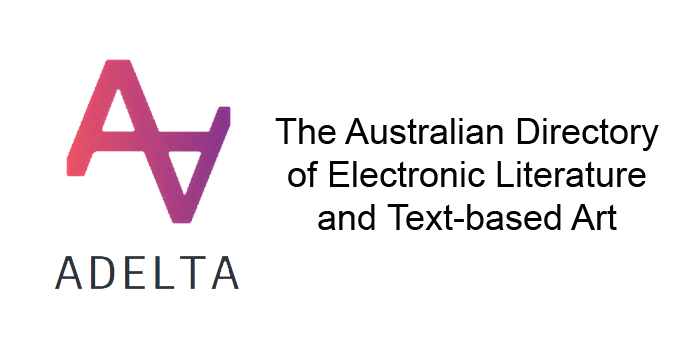 ADELTA is the Australian Directory of Electronic Literature and Text-based Art. funded project: Writers and Writing in the New Media Arts, led by Professor Anna Gibbs and Doctor Maria Angel from the Writing and Society Research Group in the School of Humanities and Communication Arts at Western Sydney University. support provided by Doctor Peter Sefton, Socorro Cifuentes, and Katrina Trewin. This project is using open source software (the Omeka platform) to house a directory of Australian writers and writing in the New Media Arts. This work is taking place in the context of work on the Consortium of Electronic Literature (CELL). This consortium addresses the development of collaboration for the purposes of researching, publishing and archiving electronic works, and is currently working on the interoperability of international databases of electronic literature. Founding partners of CELL are Western Sydney University (ADELTA), ELMCIP, Po.Ex, NT2, Electronic Book Review, University of Siegen (Likumed), Hermeneia, and Archiveit.org/Library of Congress.